Amazon Productions, founded by Kym Trippsmith in 1992, is dedicated to inspiring community and global evolution through transformational performance and multicultural networking. We are dedicated to igniting the flames of change through the adventure of performance and the promotion of women in music joined together to constructively combat social problems. AP’s first benefit show was held at the San Rafael Community Center and made more than $2000 for the homeless, as well as providing food, blankets and warm clothes for the impending winter months. Our next benefit organized high school students from all over Marin County to participate in a drive to again donate food, blankets and warm clothes to the homeless. This benefit gave these kids a chance to make a difference in their own community, which we hope helped empower them to actively take part in their communities as they grew up and moved into our greater society. 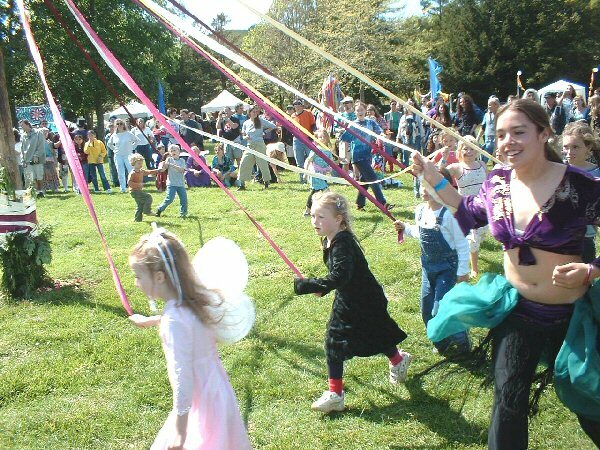 In 1992, Amazon Production produced the first of 11 annual May Day Festivals, as a gift to Marin County. Featuring bands, booths and the quintessential Maypole Dance, the festival provided an environment for children and adults to join together to create a harmonious family event and a sweet memory for all involved. After 11 years as the Executive Producer of the May Day Festival in Fairfax, I am thoroughly convinced that making miracles is what women do best. But when it comes to the “industry,” many of the best women songwriters are faced with intense pressure on how to look and how to sound if they want to be able to support themselves as artists. Today, Amazon Productions books a variety of acts including Feisty Females, Mamazon and Diva Galactika. Founder Kym Trippsmith is also an active consultant to a variety of production and event companies including Harmony Events, Deem Entertainment & Production Services, and Fifth Sun Productions. Amazon Productions also offers writing and editing services to various North Bay clients including the Global Investment Research Corp.